Listen to the November 28, 2018, episode of the Trumpet Daily Radio Show. 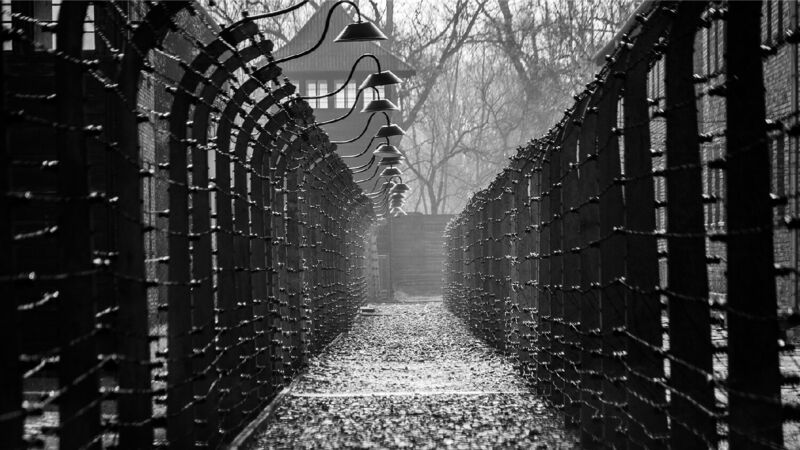 A recent poll discovered that nearly 20 percent of young adults in Europe have never heard of the Holocaust. 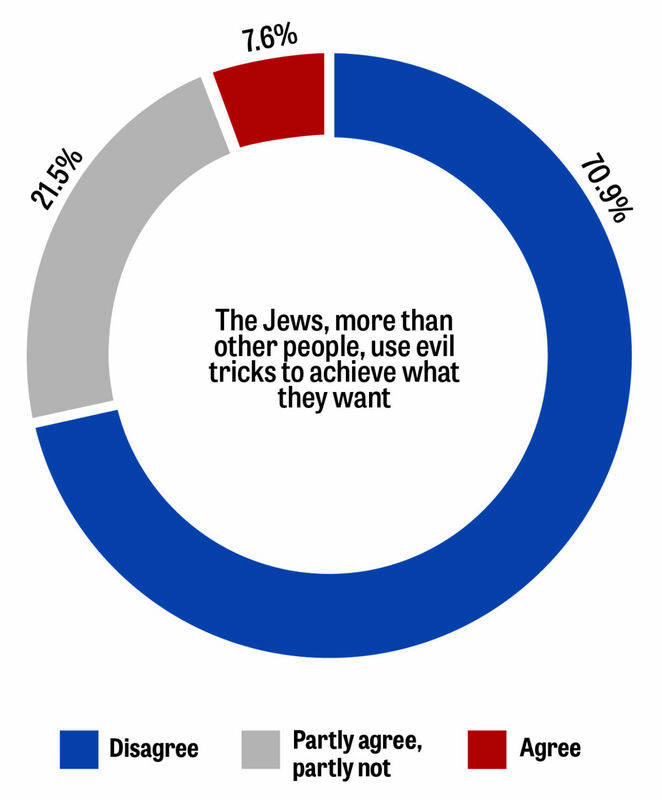 Many Europeans are even blaming the rise in anti-Semitism and other problems in Europe on the Jews! History is repeating itself right before our eyes, but too many people are ignorant and unaware to realize we’ve been here before. Both history and Bible prophecy reveal where this world is heading. For more, listen to today’s Trumpet Daily Radio Show. 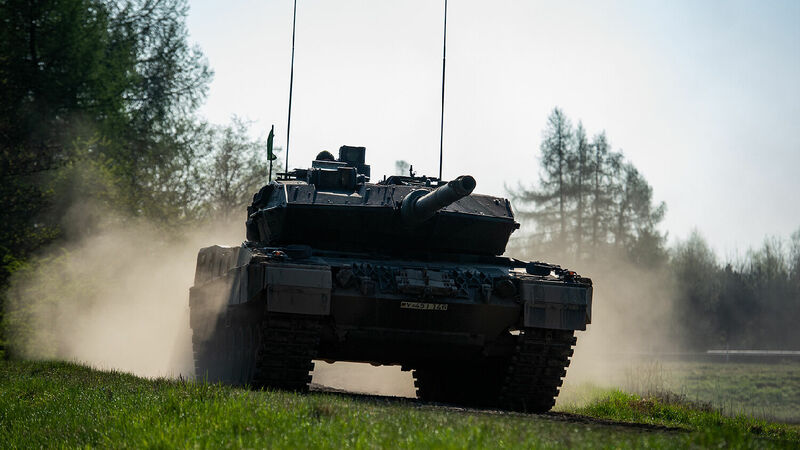 A Leopard 2 A7 tank drives across the training grounds of the German Bundeswehr. Former competitors are now collaborating against their new archenemy: the U.S.A. Should you be concerned? Europe’s call for a European army raises various questions: How powerful would such an army be? What weaponry would it use? Would it be in support of the North Atlantic Treaty Organization? Or work against it? And finally, which nation would spearhead the endeavor: France or Germany? The answer to these questions can already be seen in Europe’s arms industry. The European Union’s joint military budget is already three times higher than Russia’s budget and approximately half of the United States’. And at this critical moment in history, Russia and the U.S. are being forced to make dramatic military cuts while Europe is boosting its spending. However, Europe’s military capacity faces one major challenge: a lack of unity. Instead of joining forces in producing the best of the best, European countries have so far produced their own individual weapons systems and duplicated much of the efforts of other European countries. No sovereign European army can stand unless this changes. 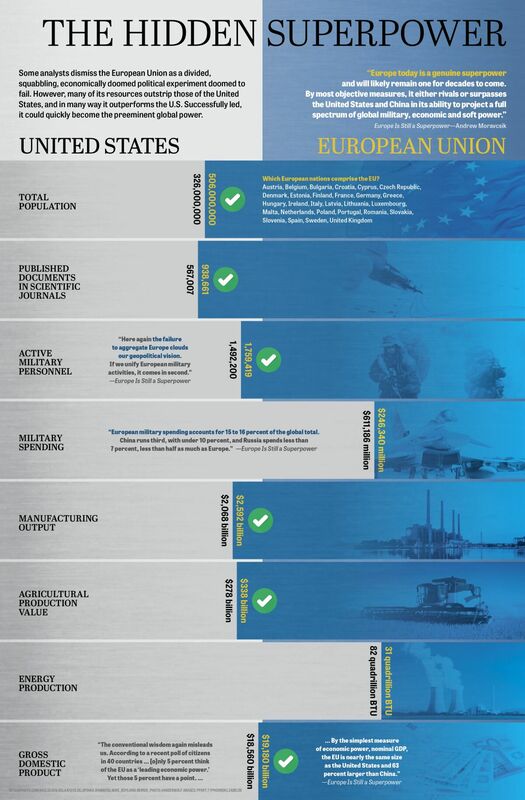 The key to gaining independence from America and to create a successful European army is to fuse Europe’s military industry. German and French industries have already designed the future generation of European tanks, jets and artillery, but the political will and structure so far has been lacking. This barrier is now breaking down, and as it does, the world’s future weaponry is destined to be made in Europe. Europe has not only the industry but also the growing economy to rise above competitors. Of course, Russia’s track record in tank development is very impressive. But no country has more experience and competence than Germany. I assume that if the Germans start with the “Leopard iii”, it will be over quickly with the advantage of the T-14. Germany’s main battle tank is currently the Leopard 2. This tank is part of the armed forces of 16 countries. As of January 2018, more than 3,500 Leopard 2 tanks are in use around the world. The Leopard 3 main battle tank, or main ground combat system, is set to replace existing stocks by 2030. The new tank is already predicted to become the world’s most powerful tank. To make the visionary project a reality, France and Germany are jointly producing the new European main battle tank (embt). The French-German joint venture is called knds (kmw+Nexter Defense Systems), combining the names of both manufacturers. The arms manufacturer has allowed only limited insight into joint production, advances and specific plans for the super tank. But its zeal to move the project forward is evident by the fact that within 15 months of the initial talks, the first model was combat ready. The tank is “proof that kmw and Nexter have established a first significant joint knds product in record time,” company officials wrote in a statement. The tank was presented this past summer at the Eurosatory 2018. The 2018 Eurosatory Daily reported on June 15 that “the embt demonstrates that their combined skills make it the legitimate and essential industrial actor of the two key French-German future programmers.” The tank combines the strength of Germany’s Leopard 2 and France’s Leclerc and is already seen as more powerful than either one individually. The new tank is lighter than the Leopard 2 and can be operated by only two crew members compared to the usual three. The lighter weight means it has the advantage of customizing up to six tons of additional equipment. But the first model is not meant for production in either Germany or France. The manufacturers plan to first export the tank for use in foreign armies that can more easily adapt to the new system. According to French media reports, Italy has already expressed interest. It is hoped that later upgraded versions will replace tanks in many more European countries. Europe’s new super tank will in the future also be equipped with a more powerful 130-millimeter cannon. Rheinmetall has already presented the new model, Stern reported on June 15: “The previous tank cannons from Rheinmetall used the caliber 120 millimeters. … The barrel length of the new weapon should be 51 times the caliber. The whole system with the shutter should weigh three tons, the pipe alone 1,400 kilograms. Overall, the performance will be 50 percent higher than that of the 120-millimeter cannon.” With the new cannon, the tank will be able to face off Russia’s T-14. Beyond a main battle tank, Germany and France have begun work on a future artillery system called the Common Indirect Fire System. France and Germany expect more European countries to join Europe’s future arms projects. One might wonder how in peacetime, Germany and France are able to improve and upgrade world-class military equipment. The answer reveals the secret of German industrial ingenuity of the last decades. Instead of stocking up its own storehouses with weaponry that later need essential upgrades, Europe exports its weapons as a trial run to later work with proven weaponry. The same is true of Europe’s new generation of tanks. Through exports, both Germany’s and France’s tanks have proved their capabilities in terrains around the world and received various upgrades over the years. Based on that data, the two arms manufacturers were able to combine the proven qualities of both tanks in one super tank. But instead of immediately arming itself with the new tank, as Russia tried to do with its T-14, Europe sells the tank first and arms itself later with an upgraded version. A previous German-French joint venture has already proved to be successful: The creation of the Eurocopter Tiger (EC 665) that was produced through German-French cooperation is today viewed as one of the most powerful attack helicopters in the world. But their cooperation goes beyond tanks and helicopters. The greatest European project of the imminent future will dominate the sky. “The two companies decided to join forces in the development and production of the next-generation fighters,” said Dassault ceo Eric Trappier and Airbus armaments director Dirk Hoke at the launch of the ila aviation exhibition in Berlin. “We want strategic autonomy for Europe,” said Trappier. New fighter jets are planned to complement and eventually replace the Eurofighter and Rafale fighter jets by 2035 or 2040. The company heads have long anticipated the next steps from the political side, according to Trappier, who said, “We say to our defense ministers, our political leaders: We are ready.” If the cooperation succeeds, the future jet is predicted to outperform the U.S.’s F-35 fighter jet. I am convinced that European sovereignty and strategic autonomy can and will only be ensured through independent European solutions. The vision that France and Germany have set forth with fcas is a bold one and it’s an important signal in, and for, Europe. The fcas program will strengthen the political and military ties between Europe’s core nations and it will reinvigorate its aerospace industry. By connecting a range of manned and unmanned platforms, the Future Combat Air System can help secure European sovereignty and technological leadership in the military aviation sector. In the past, combat pilots had to do a lot of things by themselves. But times are changing: future air power will be based on a network of intelligent, connected platforms, delivering highly accurate, real-time information. This new weapon technology enables a large variety of aircraft to fly in united swarms, detect enemy lines, and lead coordinated large-scale attacks. 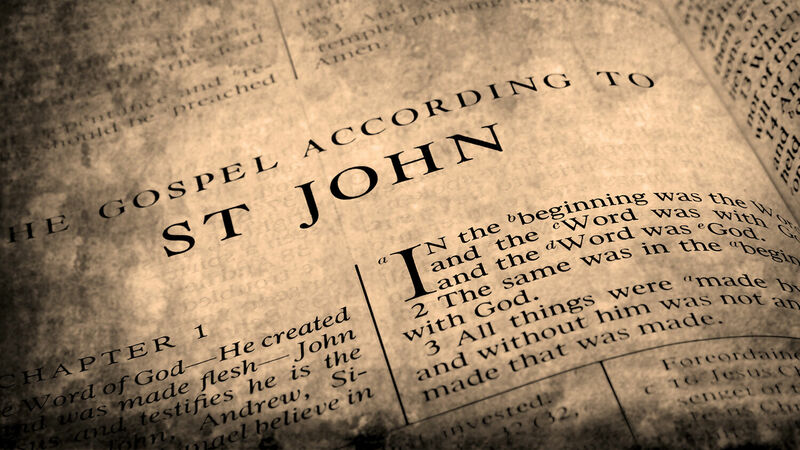 We are now gaining a glimpse into what the Apostle John saw in vision but struggled to describe due to a lack of terminology. Though fcas will be integrated in part over the next few years, the whole system is planned to be fully implemented and replace old systems between 2035 and 2040. Perhaps nothing represents the Franco-German ambition to free Europe from dependence on the United States more than the joint project to develop a new fighter jet as part of a comprehensive combat air system. Simultaneously, nothing represents exactly why Europe won’t win that independence any time soon more than the political and commercial squabbles that have beset the program before it even begins. The two nations are competing about who will take the leading role. But after the deal was signed, a quarrel broke out, again. Neither industry wants to lose out in the super deal. France is especially afraid that German industry would benefit most from the deals. France always desires to take the leading role in Europe’s military advances, but cooperating means compromising. Macron’s bold stance for an independent European army has left him with no choice but to enter a deal with the devil: German industry. The defense ministries of both countries have now agreed on how the common projects will move forward. Germany will take over the leadership of the production of the new European tank that involves the German companies Rheinmetall and kmw and the French Nexter. France will take over the leadership of the new fighter aircraft that involves Dassault and Airbus. Germany will lead a European drone program and the helicopter upgrade program, while France will head the development of a new battlefield missile system. The value of future joint European projects is estimated to be in the hundreds of billions of dollars and will soon include many more European arms manufacturers. While the rivals have now agreed on a compromise giving them both “leading positions,” expect to see Germany remain as the sole leader. We make this prediction because this outcome is prophesied in the Bible. In Daniel 2, the last human kingdom to govern this world prior to the return of Jesus Christ is represented as a mixture of miry clay and iron. Inspired by God, Daniel explained in verse 42: “And as the toes of the feet were part of iron, and part of clay, so the kingdom shall be partly strong, and partly broken.” The prophecy refers to 10 nations that unite as a military superpower that rules this world for a short time, only to be destroyed and consumed by Christ at His return. This superpower is led by Germany with France playing second fiddle. Due to European rivalries and mixtures of different peoples, the greatest weakness of this military superpower is its lack of unity. In his book The United States and Britain in Prophecy, the late theologian and founder of the Worldwide Church of God Herbert W. Armstrong explained the biblical identity of modern France. The French today are the descendants of Reuben, a tribe of ancient Israel. Reuben was Jacob’s firstborn son, but due to his gross misconduct, he was denied the leadership role in Israel. One of Reuben’s grievous mistakes was that he betrayed his brother Joseph. Genesis 49 puts these events into an end-time context (verse 1). The Bible foretells that right before Christ returns, France will again turn against Joseph’s descendants, namely the U.S. and Britain. To learn more about this remarkable prophecy, watch the video below by Trumpet editor in chief Gerald Flurry and request a free copy of The United States and Britain in Prophecy. Though Reuben lost his birthright, modern France still seeks to play a leading role in the world. Beaten in two world wars, France had to be saved by the U.S. and Great Britain. But rather than expressing gratitude, France is betraying its brothers just like Reuben betrayed Joseph. During World War ii, we saw a glimpse of that betrayal when some leading French officers collaborated with Germany rather than the Allied forces. But this glimpse is nothing compared to what we will see in this end time. France will soon cooperate on a large scale with Germany to overthrow British and American dominance. France no longer wants to be the victim of another German empire to then be saved by its brothers. Instead, France joins the enemy to the detriment of the U.S. and Britain. Read “France Is Betraying America, and Fulfilling Bible Prophecy!” to learn more about how France and America’s rivalry will end. France still hopes to lead Europe, but Bible prophecy foretells it will fall far short of that dream. Germany’s industrial might and economic strength exceed France’s by about 30 to 40 percent. Moreover Germany’s arms industry has been self-sufficient since the end of the Cold War, while France’s industry has relied on state funding. Once Germany restarts its arms industry, France will have to watch from the sidelines or join Germany’s plan of world dominance. It could protect you from a world of suffering. Is Canada Within Three Years of an Economic Crisis? Consumer debt is driving the economy in a dangerous direction. In 2017, Canada’s finance minister exclaimed that the Canadian economy was “firing on all cylinders.” The International Monetary Fund forecast Canada would lead all other G-7 nations in economic growth. Things certainly seemed rosy. Now a year has passed, and the data is proving that Canada’s economy is not as robust as expected. In fact, it’s in a very dangerous position. The metrics include the difference between current and historical ratios of private, nonfinancial debt to gross domestic product—the credit-to-gdp gap—and the ratio of outstanding debt to income, known as the debt service ratio, at the national and household levels. When these early warning indicators cross a certain threshold, the bis highlights them in amber. When they cross a higher threshold, indicating an even greater likelihood of a banking crisis, it turns them red. All of Canada’s indicators are red or orange, meaning conditions in the country’s banking system are favorable for a crisis within the next three years. Debt in Canada is reaching unsustainable rates, and more and more analysts are beginning to sound the alarm. According to Canada’s Toronto-Dominion Bank, costs to service Canadian debts are on track to surpass all previous records. They report that by 2020, interest principal payments will exceed 15 percent of disposable income for Canadian families. That would break the record set in 2007, just before the financial crisis of 2008. Trends are clearly building the same way they were back then. This problem is exacerbated by the fact that the Bank of Canada has been slowly raising interest rates since the middle of 2017. This is putting the squeeze on more and more Canadians who are maxed out on debt. The Toronto-Dominion Bank reported that rising interest rates would require households to spend between $300 and $526 more per month to service debt. With the cost of servicing debt growing for everyday Canadians, the expectation is that bankruptcy claims will rise. 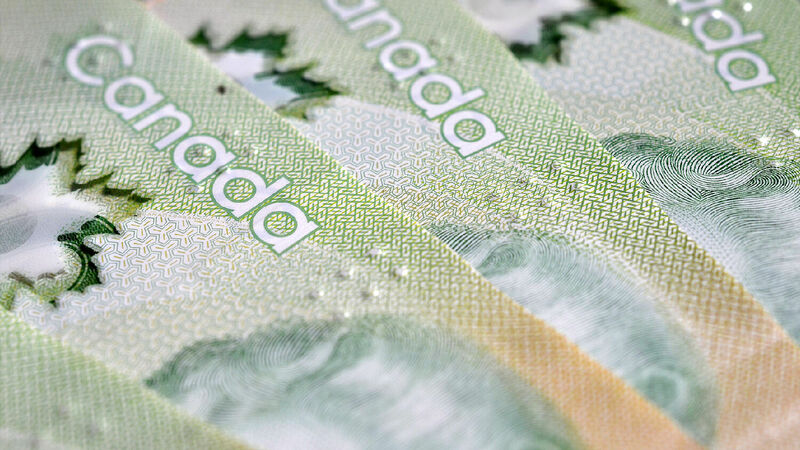 While claims have remained stable over the last few years, a report by the Canadian Association of Insolvency and Restructuring Professionals predicts that 2019 could see a huge spike in claims. Their study of 20 years of Canadian data found that there is generally a two-year lag between the rise of interest rates and the rise in bankruptcy claims. The middle of 2019 will mark two years since interest rates began climbing. It’s unknown how many claims there will be, but there is a strong expectation they will rise. The problem stems back to the fact that Canadians are hooked on debt. For years, record-low interest rates have made borrowing essentially free. But the day of reckoning is approaching. Data from the government shows that Canada’s debt-to-income ratio is about 170 percent: That means that for every dollar of disposable income, the average Canadian owes $1.70. And that’s just the average. As the Bank of Canada aptly reports on its own website, “Notice that the 170 percent figure represents an average across Canadian households. It includes all those who have little or no debt, which means, to make the average level of debt so high, it also must include some very highly indebted Canadians.” It goes on to show that 8 percent of indebted households owe 350 percent or more of their gross income. Canadians fail to recognize the dangers of debt. Complicit in the problem are lenders who make debt more and more appealing. A study from early 2018 by J.D. Power Inc. found that 55 percent of new car sales in Canada were financed over an 84-month period or longer. That’s a seven-year car loan! Comparatively, less than 10 percent of loans for new cars in the United States were taken out for the same length of time. While the standard term length used to be five years, lenders have found that Canadians are favoring longer terms. Consumers get a brand new car for cheaper monthly payments, and lenders make more in interest. 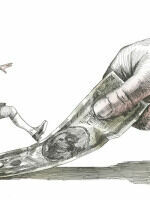 The danger is that many who take out these loans end up losing money in the long run. When it comes time for a new car a few years down the road, consumers owe more on their loan than the car is worth. The same problem of losing money on a loan is evident in the housing market. Canadian housing is the third-most overvalued housing market in the world, with houses 56 percent overvalued. Leaving that aside, Canadians have worsened their situation through borrowing money against their overvalued homes. With low interest rates, there has been a rise in Canadians taking out home equity lines of credit (heloc). Canadians began borrowing money against the value of their own homes. These loans generally only require you to pay the interest each month or a small percentage of the principal. Originally these lines of credits were offered by the banks for home improvements to increase the value of a house. But they aren’t restricted to just that, and Canadians have used them for just about everything. The Financial Consumer Agency of Canada (fcac) reported last year that these lines of credit had been used to fund the purchase of depreciating assets, such as cars, and even speculative stocks. From a financial standpoint, these are costly decisions. All these factors are leading to a perfect financial storm, one that Canadians are deeply troubled by. There could be as many as three more interest rate hikes in 2019. Higher interest means higher interest payments, which many Canadians cannot afford. A survey conducted by the Canadian Broadcast Corporation found that almost 75 percent of Canadians are worried about rate hikes. 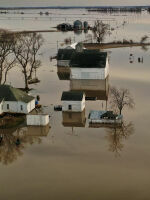 It found that 58 percent couldn’t afford a $100 per month increase to their debt costs, or any other costs. They would have to change their spending habits or sink deeper and deeper into debt. Looking at these terrible economic trends, it leaves no doubt that Canada is on its way to an economic crisis. However, while the bis issued its harrowing warning earlier this year, the Trumpet has been forecasting a decisive economic crisis in Canada for decades. How could we make such a prediction? Like all of the Trumpet’s forecasts, our analysis of world events is made under the clear light of Bible prophecy. God revealed thousands of years ago what would happen in the world “in the last days.” This is the time period we live in right now, just before the prophesied Second Coming of Jesus Christ. How does Canada fit into Bible prophecy? If you would like to know, then request and study our free book The United States and Britain in Prophecy. God has a lot to say about those two nations, and Canada, as a former colony of Great Britain, is included in these prophecies. These nations, which have been so richly blessed by God, have turned to sin and rebellion against God. As a result, God says they are cursed! One key prophecy outlining the curses God pronounced for their rebellion is found in Deuteronomy 28. God spelled out exactly what would happen for their sins, and we are seeing this play out today. In verse 44, God shows that one of the curses would be debt—debt that can’t be repaid. This leads to total economic collapse. Canadians may have thought debt a blessing as they enjoyed all kinds of material things purchased on credit at super low interest rates. But debt is a curse! It is a trap that only gets worse and worse. Perhaps you are caught in the vicious cycle of debt, unsure how to escape. Perhaps you’re not, but want to storm proof your financial house. Our free booklet Solve Your Money Troubles! offers practical ways to guard against the worsening economic times we live in. It will help do exactly what the title states. But those steps will only help you to a certain point. Total economic collapse is prophesied to come. That’s why it’s important to read our free book The United States and Britain in Prophecy. This book reveals the cause behind Canada’s economic woes. It forecasts the devastating curses about to befall the nation. It outlines how you personally can escape those curses. And it shows the glorious hope for Canada—and the entire world—when Jesus Christ returns to bring peace, prosperity and true abundance to all mankind. 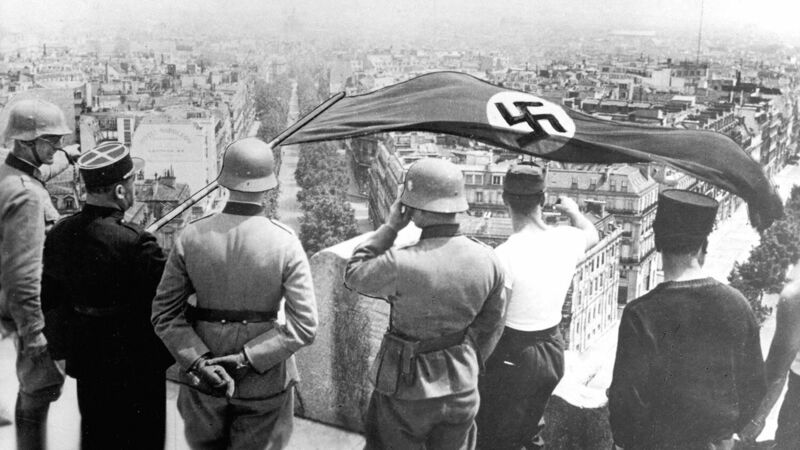 The Nazi flag flies from the Arc de Triomphe in June 1940 during the German occupation of Paris in World War ii. Germany is not to blame for World Wars i and ii. Instead Germans should celebrate ‘1,000 Years of German Empire—Our History, Our Achievements, Our Pride.’ Welcome to the new German history. Who is ultimately to blame for World War ii? The answer given by the glossy, color magazine sitting on my desk may surprise you. It is Britain, America and most of all, Wall Street. It states that “the American financial capital enslaved Germany—and promoted the dictator,” referring to Adolf Hitler. Welcome to Compact, the magazine rewriting German history. Compact is the magazine of Germany’s alt-right. It focuses on news, politics, hating America and the odd conspiracy theory. In spring 2017, its editors introduced a new series: Compact History. They quickly discovered there was a strong demand within the far right for this new history. Now Compact History comes out three times a year. In front of me I have their latest—a special issue on the Treaty of Versailles, published 100 years after the end of World War i. The magazine argues that Germany was persecuted at the end of the war by greedy westerners. “The peace dictate of Versailles created ideal economic conditions for the growth of Hitlerism,” says its final article. World War i is not the only period in German history to get this treatment. The first issue was titled “1,000 Years of German Empire—Our History, Our Achievements, Our Pride.” It described Germany’s “millennial kingdom.” Articles on the glory of Charlemagne, the Holy Roman Empire of Otto the Great, and the rise of the Habsburgs paint a shining picture of Germany’s past. Compact History’s next issue was on “German Heroes,” then “Mythical Germany,” and next “The War That Had Many Fathers,” with a radical new view of the causes of World War ii. Compact is part of the growing fringe of German politics. It has strong links to the Alternative für Deutschland, which is polling around 15 to 20 percent of the vote. But the rewriting of German history has an even broader appeal. 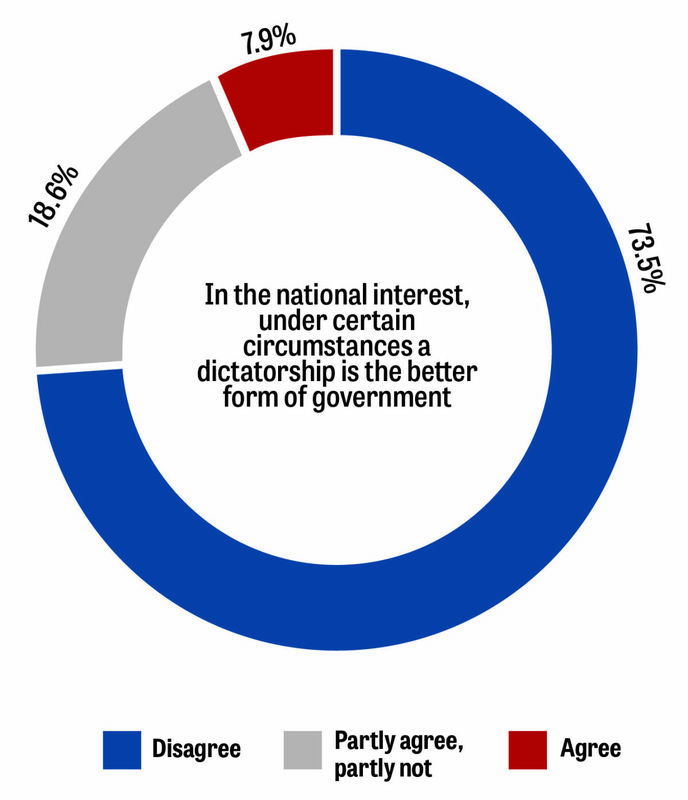 Earlier this month the University of Leipzig surveyed 2,400 Germans on their attitude toward authoritarianism. What they found surprised many. That so many are so wishy-washy about statements like “The crimes of National Socialism have been greatly exaggerated in history” is disturbing. 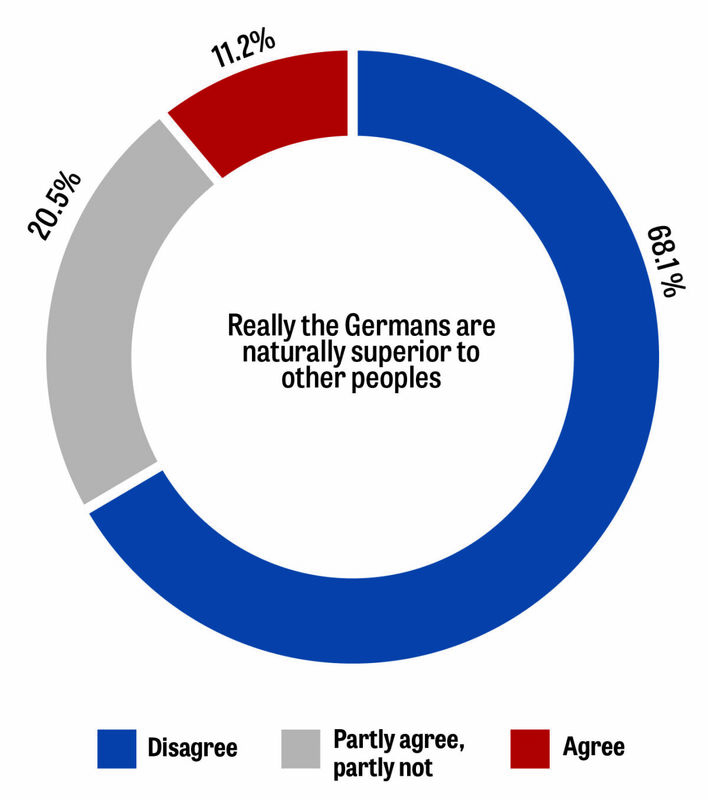 That’s not the kind of question that any right-thinking person should answer “partly agree, partly disagree”—let alone “completely agree.” But 28 percent of Germans did. 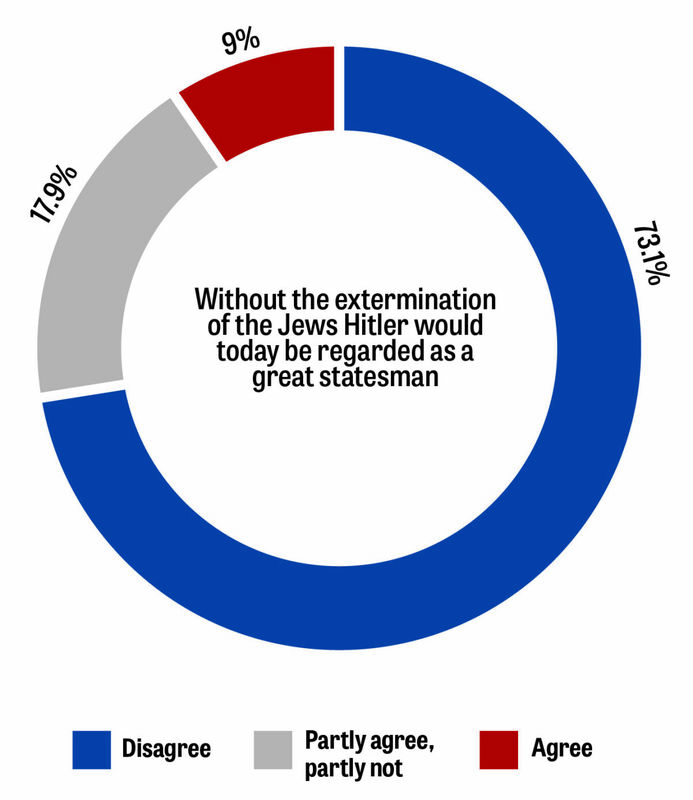 Putting these figures together, the study concluded that at least 26 percent of Germans partly agreed with the idea of having a dictator in certain circumstances. In former East Germany, this rose to nearly 40 percent. But some of the biggest surprises came on questions about Germany’s role in the world. One such statement was, “We should finally have the courage to have a strong national feeling again.” About 37 percent said they completely or mostly agreed. Another 30 percent partly agreed, partly didn’t. The statement, “What our country needs today is a hard and energetic enforcement of German interests vis-à-vis foreign countries,” got similar results. Germans want to be proud of their history, and they want their nation to throw its weight around on the world scene. The biggest obstacle to this is their history. Already a shocking number are ignorant of it—hence this effort to rewrite it. Another study revealed that Germans are uniquely proud of their culture. It asked Europeans if they thought their own nation’s culture was more valuable than their European neighbors. In Germany, 46 percent said yes. Just next door, in France, that figure was only 23 percent. This is Compact’s message. And that’s why more than just Compact is responding to this idea of cultural superiority. The book Our History—Germany From 800 Until Today, from a mainstream, reputable publisher, aims to give “a different narrative of German history.” Christopher Clark’s book The Sleepwalkers, first published in the run-up to the 100th anniversary of the start of World War i, is still making waves with its claim that Germany is not guilty for World War i. (I reviewed The Sleepwalkers at the time in my article “The War over World War I.”) Frankfurter Allgemeine Zeitung noted that the success of Clark’s book within Germany “betrayed a deep-rooted need” for Germans “to free themselves from blame and guilt” for World War i. Much of this rewriting of history comes from outside Germany. Despite its title, Our History—Germany From 800 Until Today is written by non-Germans. Clark is an Australian at Cambridge University. And some of the best warnings about the dangers of this revisionism come from German historians themselves. The response to Fischer’s book was explosive—also literally. His office was firebombed. The government tried to stop him from leaving the country, and Franz Josef Strauss, one of Germany’s most influential conservative politicians, denounced him in parliament. But Fischer’s argument for Germany’s war guilt was strong, and he eventually won over the German historical establishment. In 1972 Geiss pronounced the controversy over, declaring, “The overwhelming role played by the German Reich in the outbreak of World War i and the offensive character of Germany’s war objectives is no longer a point of controversy, nor is it disputable.” Few at the time disagreed with him. Unfortunately, enough time has passed that Fischer’s work has been forgotten and new interpretations of history are slipping in. Over the last few decades, a whole school of German historians gave similar warnings based on this history. Heinrich August Winkler, chair of modern history at the Humboldt University in Berlin, wrote, “In light of the role that Germany played in the genesis of the two world wars, Europe and the Germans cannot and should not desire a new German Reich, a sovereign nation-state, anymore. This is the logic of history ….” The late Hans-Ulrich Wehler warned against “the classic mechanism of locating the source of evil outside one’s own history.” He saw a tendency in some German historians to blame other nations for the crimes of the Nazis, and he fought that tendency passionately. These men were quick to criticize anyone who even looked like they might try to rewrite this history. Now many are retired or deceased. This movement to rewrite German history comes at the same time as a Continent-wide shift. All across Europe, this history is receiving a new and glossy write-up. It focuses on the same history that Compact did in its first issue: the Holy Roman Empire. In September, Aachen Cathedral held a weeklong festival to celebrate Charlemagne (or Karl der Grosse, as he is known in Germany). Austria is using its rotating presidency of the European Union to put the Holy Roman Empire on display, advertising the Imperial Treasure in Vienna and the crown of the Holy Roman Empire. Austria displayed this heritage at the heart of the EU—in the European Council building in Brussels—to try and get Europeans to reengage with this history. As part of this year of cultural heritage, a meeting was held this summer in Berlin. The organizers wrote, “Cultural heritage must be given a much bigger importance in education activities—both formal and informal—for all ages. … Special attention must be given to history education and heritage interpretation.” Of course, they emphasized that this “interpretation” should uphold the European Union. Why is this history receiving a resurgence all across Europe? The desire for national greatness, and for Europe to throw its weight around in the world the way it used to, is part of the answer. But not all of it. The Bible tells us that events in modern Europe have a deep and intimate connection with the past. Much of this vital biblical background is found in the books of Daniel and Revelation. In Daniel 7, God summarizes the history of the world from that point on with four beasts. The first beast, “like a lion,” pictured the Babylonian Empire, then in existence. The next, “like to a bear,” pictured the Medo-Persian Empire that would soon replace it. The next, “like a leopard,” symbolized the Greek Empire of Alexander the Great. And the final beast pictured the Roman Empire. This beast was “dreadful and terrible, and strong exceedingly; and it had great iron teeth: it devoured and brake in pieces, and stamped the residue with the feet of it” (Daniel 7:7). Sure enough, Rome conquered and dominated the world on a scale and ferocity never matched before. Ten horns came out of this 10th beast, symbolizing “ten kings that shall arise” after this empire fell. Kingdoms have repeatedly risen up, resurrecting the Roman Empire. So it was that Charlemagne and Otto the Great were all crowned “Caesar Augustus,” the Habsburg emperors traveled to Rome, and under Napoleon Bonaparte, the eagles of the Roman legions once again flew over Europe’s battlefields. God says that this empire is “exceeding dreadful … which devoured, brake in pieces, and stamped the residue with his feet” (verse 19). That is His verdict on Europe’s history. At the same time as this shift in history, there is a growing appetite within Germany for a strongman. Daniel prophesied of this too: “And in the latter time of their kingdom, when the transgressors are come to the full, a king of fierce countenance, and understanding dark sentences, shall stand up” (Daniel 8:23). Herbert W. Armstrong began forecasting this trend in Europe all the way back in the 1920s. In 1945, he wrote that Germany would rebuild itself and dominate Europe as part of “a European Union.” He made these accurate predictions, and many more, based on the Bible’s prophecies. The Bible tells us to expect a 10-nation power in Europe. It tells us that it will be a resurrection of these historic powers—a continuation of Europe’s previous empires—and it tells us it will be led by a strongman. Now we see a European Union, dominated by Germany, though not yet shrunk down to 10 nations. It is publicizing and promoting these historic empires, and there is a growing demand for a strongman. Even right now, Europe matches very closely the prophesied empire in your Bible. To learn more about this return to Europe’s history, read Mr. Flurry’s article “The Holy Roman Empire Goes Public—Big Time!” To study the biblical prophecies that are so crucial to understanding this modern European empire, read our free book The Holy Roman Empire in Prophecy. This book will show you how the Bible has already proved stunningly accurate in describing Europe’s history. And it will show you how a true reading of this history helps us see what is coming next in Europe. A view of Crimean Bridge across the Kerch Strait closed for the passage of civil vessels. The Russian Navy captured three Ukrainian naval ships on November 25 after opening fire on them in the Kerch Strait, marking a major escalation in tensions between the two nations that have been mired in conflict since 2014. The Kerch Strait lies off the eastern edge of the Crimean Peninsula and is a vital shipping route connecting the Black Sea to the Sea of Azov, home to two of Ukraine’s most important ports. The Crimean Peninsula was part of Ukraine’s sovereign territory until 2014, when Russian forces unlawfully and forcibly annexed it. In May, Russia completed construction of a 12-mile-long bridge across the Kerch Strait, which connects Crimea to Russia. The Crimean Bridge tightens Moscow’s grip on the peninsula and improves Russia’s connectivity and economic power. But it hinders Ukrainian trade. 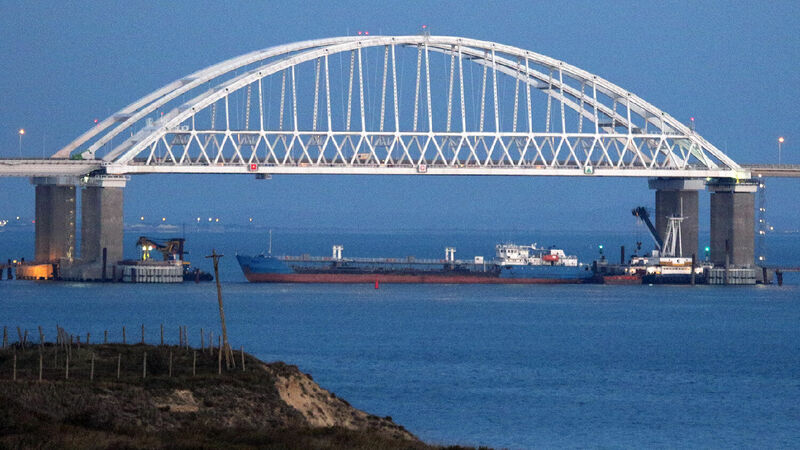 For decades, the Kerch Strait has been a vital shipping route for Ukraine, but the new bridge is too low for many standard-sized container ships to pass beneath. This has caused disruptions to Ukraine’s shipping, forcing it to use smaller and less efficient ships to pass through the route. A 2003 treaty designates the Kerch Strait and Sea of Azov as shared territorial waters for Russia and Ukraine. But since completing the bridge, Russia has worked to increase its control of the waters. It has sporadically blocked access to Ukrainian vessels transporting lucrative grain and steel exports from Eastern Ukraine, effectively creating temporary chokeholds on the Sea of Azov. МВС України спецзасобами отримало доступ до відео провокації -тарана російського прикордонного корабля “Дон” українського судна. Перехоплене відео знято російськими, чутні команди - це піде доказом в міжнародний суд! Moscow then scrambled helicopters and fighter jets to the location as Russian naval forces surrounded the Ukrainian vessels. The Russians opened fire on the warships, injuring six crew members, and then seized all three vessels. Moscow claims the Ukrainian vessels had illegally entered Russian territorial waters. Ukraine maintains that its ships were operating lawfully, and accuses Russia of unprovoked military aggression. Ukrainian President Petro Poroshenko said there was “irrefutable evidence” that Russia’s behavior constituted “aggression.” The attack on Ukrainian vessels was “not a mistake,” he said, “but a deliberate action.” Poroshenko asked Ukraine’s parliament to impose martial law on the country, of which it approved a limited version on November 27. Since Russian President Vladimir Putin has kept eastern Ukraine in a state of prolonged and frozen conflict, it is easy for onlookers in other nations to lose urgency about the crisis. But this week’s Kerch Strait incident is a fresh reminder of the danger and power of Putin’s Russia. Back in 2005, Putin famously called the demise of the Soviet Union “the greatest geopolitical catastrophe of the century.” And he has been working ever since to restore Russian power to its Soviet levels. Putin’s restoration project has included resurrecting relics from the Soviet “glory days,” such as the Soviet anthem, the Hero of Socialist Labor award, a Stalin-era public physical fitness program, and a Soviet-style law against dissent. And in 2008, Putin showed his people and the world that he was even willing to use force to recreate the geography of the Soviet Union. That August, his armed forces invaded the former Soviet republic of Georgia, easily defeating all resistance. Moscow seized control of 20 percent of Georgia’s territory, and remains in control of it to this day. This was a major geopolitical event, sending shock waves around the globe. Time proved that forecast accurate, with Russia’s March 2014 invasion and annexation of Ukraine’s Crimean Peninsula. Putin had literally redrawn the borders of Europe—twice. Mr. 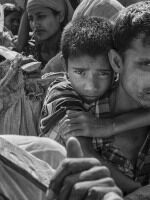 Flurry wrote, “The fact that one man—one man—is responsible for this huge geopolitical shift is deeply significant” (March 2014). Since then, Putin has continued using his power to prevent Georgia, Ukraine and other former Soviet countries from developing closer ties with Europe. He is also turning Russia’s military into a modern and more lethal 21st-century force. He pushed America out of his backyard in 2014 by persuading Kyrgyzstan to oust the U.S. from Manas Air Base. More recently, Moscow has become deeply involved in the Middle East, sidelining America, helping the brutal Syrian regime to stay in power, and allowing Iran to maintain its pursuit of nuclear weapons. It is clear that Putin has made some major gains in his quest to restore Russia’s power and international relevance to its Soviet levels. And Bible prophecy shows that, going forward, he will lead Russia into an even more dangerous and aggressive direction. What we are seeing in Russia ultimately leads to the transition from man ruling man to God ruling man! And it is almost here! It is just a few short years away. We need to watch Vladimir Putin closely. I believe he is almost certain to be the “prince of Rosh” whom God inspired Ezekiel to write about 2,500 years ago! We need to watch what is happening in Russia and how Europe responds to it. … Russia’s resurgence—which we see reported in headlines often—shows that end-time Bible prophecies are rapidly being fulfilled! In the near term, the rise of Putin’s Russia is a harbinger of terrible global tumult. But this development is intimately tied to the best imaginable news: Jesus Christ is going to return to Earth and usher in an age of peace and prosperity for the peoples of Russia, Ukraine and all the world. Listen to the November 27, 2018, episode of the Trumpet Daily Radio Show. In an exchange recorded in John 21, Jesus Christ asks Simon Peter three times: “Lovest thou me?” Each time Peter replies that he does love Christ. So why did Christ keep asking him the same question? Packed within this episode are many details and lessons we can learn about what it means to have enduring love!